I love to spend time in my kitchen, cooking and baking, making trials, mixing things and trying out recipes. Yesterday I came out with something really yummy using season’s flavours, such as cinnamon. So I want to share with you these two sweets, Yogi Christmas Fudge and Christmas Chocolate. Sweets and goodies make part of yogi life too. Generally yogi sweets are made of all really natural ingredients, such as seeds and nuts, vegan fats, not-so-much-refined sweeteners, all as close to the natural state as possible. And using bio-organic ingredients, when ever possible. These two recipes are fast and easy to make, so they are suitable also for surprise visitors, in case you have the ingredients in your house. I hope you enjoy these sweets. Share your comments below, if you want. paste, maple syrup and cinnamon and heat up stirring until smooth and homogeneous. Heat it up only as much as needed to make a workable paste, no cooking needed. Separately, mix the shredded coconut, sesame seeds and cocoa powder together, and then add it all to the sunflower-seed-maple syrup-cinnamon paste. Prepare a form (I was using a rectangle form, about 15cmx25cm), lining it with a greaseproof paper. Use enough of paper to later wrap it around the fudge. Put the fudge paste into the form, spread evenly and press it tight using your hands or knuckles, keeping part of the greaseproof paper between the fudge and your skin. Allow to cool down in the fridge for 30-60 minutes and cut into small pieces to enjoy. If you are in a hurry, use your freezer (10-15 minutes). Stores well-covered in a fridge for 4-5 days, if not eaten before. 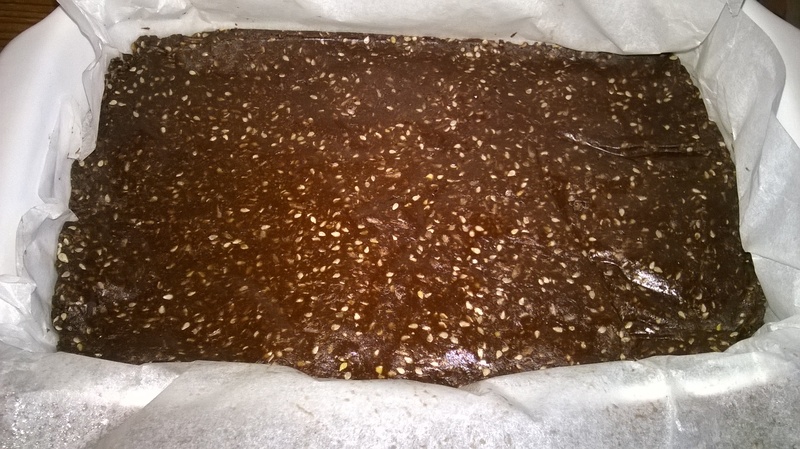 My fudge recipe is inspired by the Sampoorna Yoga Studio in Brussels. I changed some ingredients and added spice. Melt the chocolate gently, on low heat in bain-marie. Mix the spices together and then to the melted chocolate with the raisins. Prepare a form or plate, lining it with greaseproof paper. Pour the chocolate mix to the form or plate, spread evenly and set to fridge to set again. If you are in a hurry, use your freezer (10-15 minutes). Cut or crack into smaller pieces and enjoy. Stores well-covered in a fridge for weeks, if not eaten before. 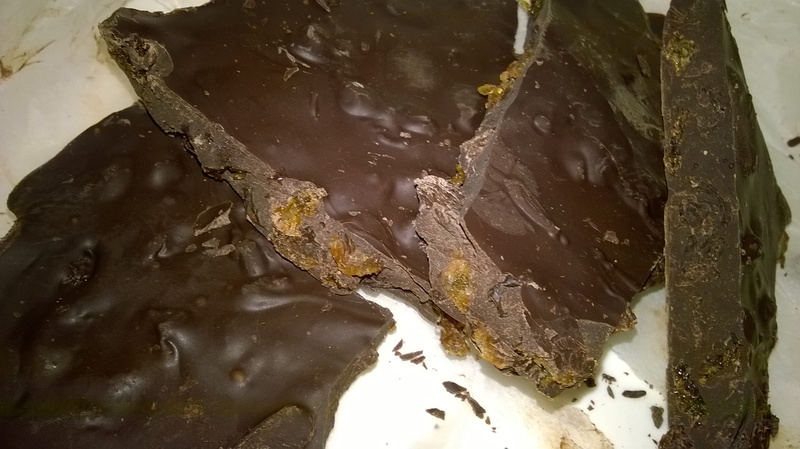 This entry was posted in Cooking, Food, Sweets and tagged bio-organic, chocolate, Christmas, cinnamon, season's taste, spices, sweets and goodies, Yogic fudge. Bookmark the permalink.